I’ve just spent days nutting through all the information I gathered in Dublin and am confident that I have figured out the structure of the Paget family in Mayo. It’s lucky that there were so many documents from all the Pagets called Thomas, Robert or James at the Registry of Deeds where the preamble lays out the residence of each at a precise date and the relationships between them. I’m also very grateful to the first Thomas Paget of Knockglass for marrying Margaret Orme since her family history is all in Burke’s – genealogy the easy way. The result is that the Beatty side of Harold Beatty’s family tree now goes back a generation further than the Forster side – well the Orme part does anyway. Our 7th great grandfather William Orme (1614-1665) owned and resided at Hanch Hall, a serious mansion in Staffordshire. The other thing I worked out is our relationship to Mary Robinson (nee Bourke) the former President of Ireland. The local history experts in Enniscrone, Co. Sligo told me that we were bound to be related to her through the Bourkes of Ballina. So we are! She is our 5th cousin for those of the same generation as I am. How thrilled she would be to know that! I think we should all go and visit! 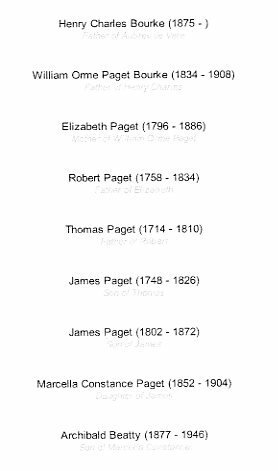 🙂 We share the first Thomas Paget of Knockglass as our 4th great grandfather. From Thomas Paget of Knockglass (centre) up to Mary Robinson’s grandfather and down to mine. The Bourkes of Ballina, like the Beattys, are a family where marrying one of the Pagets of Mayo made such a big impact that Paget recurs for many generations as a forename. The Mr. Paget Bourke of Ballina (our fourth cousin once removed) who Aunt Peg Beatty was referred to on her 1953 visit, was later knighted by the Queen. What a shame he was out and she didn’t get to meet him. She was such a monarchist and would have loved following his career. Considering Donohoe in “The History of Crossmolina” (p.588) describes the Pagets as “a minor family who did not figure much in the political and social life of North Mayo…[and] died out” I think they’ve done, and are still doing pretty well! Registry of Deeds index proj.